Recognition of an ecclesiastical entity comes from God! 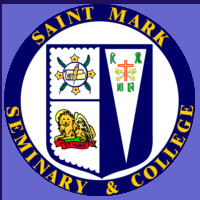 St Mark seminary & College believes in complete separation of Church and State and, like most religious institutions, has opted not to seek voluntary regional or national accreditation. However, it is exempt from certification with the Commonwealth of Virginia Commission on Education, and with the Minnesota Department of Revenue. It is ecclesially accredited and chartered by the Syro-Russian Orthodox Catholic Department of Education located in Athens Greece, and under the administration of Dr Basil Gikas. The Syriac-Greek Antiochian Synod of Bishops allows it to function as an educational institution of the Archdiocese. It is a member institution of the International Organization for Development of Freedom of Education (OIDEL) of Switzerland. It is also a chartered member of Medicina Alternativa of Sri Lanka. Specific programs are recognized by various agencies that will admit graduates into membership and/or licensure and they are the Commission on Religious Counseling and Healing, Council on Chiropathy (Registered with California Secretary of State), and North American Canon Law Society. It is affiliated with St Dionysios Seminary and University of Athens Greece. It actively seeks affiliation with other agencies that will enhance our goals, reputation, and academic credibility.